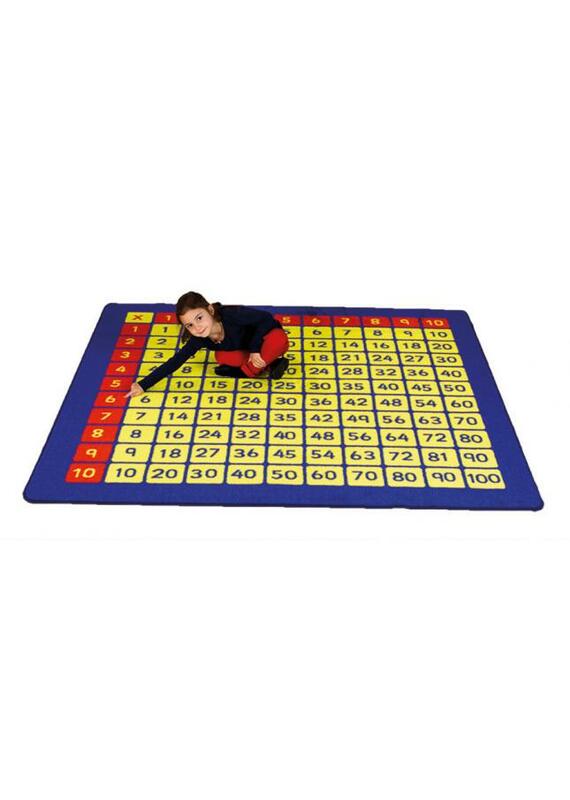 The large 100 Square Multiplication Grid Number Mats are specifically designed for use in schools. Designed to aid Key Stage 1 Numeracy Curriculum and support times tables. The high visual brightly coloured classroom mat will help encourage learning in a fun and interactive way. Designed with comfort and durability in mind, the classroom rug is manufactured using a heavy duty tuf-pile which is an extra thick, soft textured tufted Nylon twist pile. Suitable for reading or play areas, it features a specially designed Rhombus anti-slip backing which allows you to use on all surfaces. Our classroom carpets are crease and stain resistant and can easily be spot cleaned with a damp cloth, and rolled up and stored away when not in use. Complete with a 1 year manufacturer’s warranty and meets safety standards EN71 Parts 1, 2 and 3. Also available 100 Square Counting Grid Number Rug.